Okay here we go. I have never done this so we will see if I ever do it again. Hee Hee!!! I have this cute cute set from Ingrid B Designs. I think Stella Marie may have wore it once and then she grew in the bottom so the pants do not fit. Love this set. 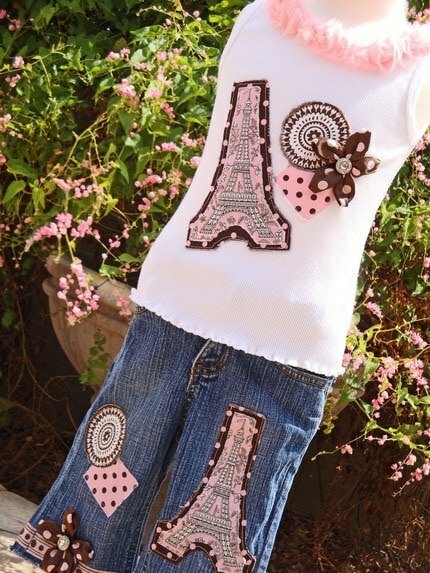 I have the adorable top, jeans and she even made custom hair pieces to match. The hair accessories look like the flowers on the jeans. They too come with the crystal buttons in the center. I don't have pics of Stella Marie in the set. It was pre pic days. The jeans are a size 5 and adjustable. It retails 81 dollars with the hair accessories. Let's say 40 dollars which would include shipping or best offer. I will do paypal only. Only because I really do not know what I am doing. Hee Hee! Email me with any questions. Ingrid B Designs was one of my first Etsy purchases. I have several of her designs. My favorite are her overhauls and baby blankets. They make great newborn baby gifts. She also packages everything so pretty. Getting her clothes in the mail is such a wonderful presentation. Sold! How fun was that! What a cute set! I bet that did not take long to sell at all. Love her designs. Wow! You have to do more of these! Haha - Stella Marie sounds like Lillie. Lillie's little behind keeps growing. It is so much bigger than her little waist and I already am having a hard time finding her shorts and pants to fit. Haha!